The questions about recycling polystyrene are ones that concern the public, as there have been issues surrounding it. There is a general lack of understanding and awareness about recycling practices for polystyrene.While most plastic items—whether used for home or business—can be easily recycled, there have been some challenges with expanded polystyrenes. These are more commonly referred to as EPS, plastic #6, or Styrofoam. EPS is used to store, serve, and secure a wide range of goods, including food items. Recycling EPS isn’t always easy—it requires initiative both from the consumer and the recycler. Let’s break this down a bit and look at a few of the challenges presented when recycling EPS. Because of its lightweight nature, this type of polystyrene plastic is hard to collect from curbside containers—it often blows away and ends up as litter. Here’s another fly in the ointment: disposable, single-use polystyrene food trays, plates, and cups can be recycled, but are often contaminated with food scraps, paper, and other types of plastic. So when these materials are placed in a co-mingled curbside container, scooped up on a recycling truck, and transported to a recycling facility, this type of polystyrene material needs to be gathered and sorted out from other types of material and washed for contamination. 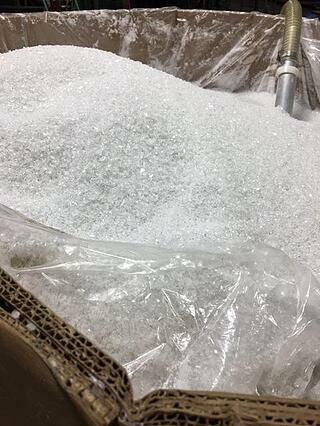 Furthermore, polystyrene cannot be recycled locally; it has to be transported to a centralized plant. Thus, increasing the cost for the recycler and reducing the incentive to recycle. The great news here is that there are many large-scale recyclers that work with proven models that counter these measures—and advocate for (and implement) environmentally sound practices. One industry practice that began in 2014 involves a recycling process that turns EPS into “regular” polystyrene (it can, in turn, also become EPS again). 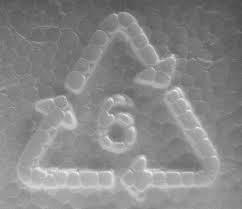 Some of this recycled polystyrene is used to create products, such as surfboards, synthetic lumber, and glue. As stated above, Alpha Rho works with general-purpose polystyrene to produce our large assortment of rigid plastic boxes. With this type of hard plastic, we implement an internal recycling program to eliminate waste. Our materials are non-toxic and FDA compliant, so are safe for use with food products, though our products are not considered single-use containers (as they are not made of expandable foam materials). Our polystyrene recycling process involves using a combination of virgin resin (polystyrene) pieces (basically ground up fragments of hard plastic pieces) and “scrap” pieces of polystyrene, called regrind. Regrind comes from the excess material “shed” from the boxes after they are molded into shape. This postindustrial regrind is mixed in with the virgin polystyrene and melted together into one product. This helps reduce waste while keeping the integrity of the polystyrene intact. Alpha Rho is the largest manufacturer of a wide assortment of stock and custom clear polystyrene lid and hinged plastic boxes for handling, packaging, and storage applications in New England. With measures like our internal recycling program and the installation of solar panels, we’re proud to practice sustainable measures to minimize our footprint and contribute responsibly the environment and to our community. Click here to request free samples of our clear polystyrene plastic boxes.